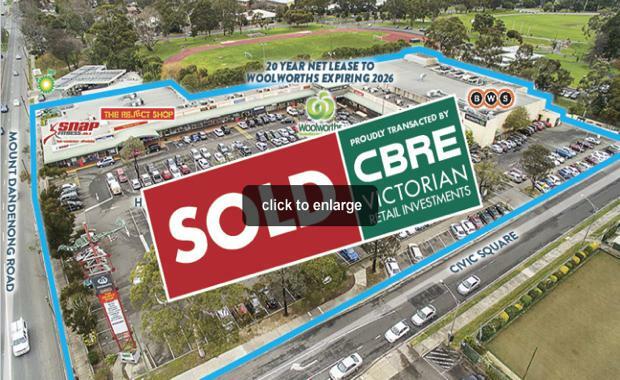 An offshore Chinese investor has acquired the Civic Square Shopping Centre in Croydon for $30.51 million. The property, which is anchored by a Woolworths supermarket and has 18 specialty retailers, was acquired on a sharp passing yield of 6.17 per cent. The centre, which was built in in 1985, and refurbished in 1991, was sold on a building rate of $4,789 per sqm. The centre is located at 224-238 Mount Dandenong Road, Croydon and has a floor area of 6,371sqm and 292 car spaces. The Expressions of Interest campaign attracted 13 formal offers, including a mix of local and interstate private investors, syndicators, institutions and offshore investors. The sale was negotiated by CBRE's Mark Wizel and Justin Dowers.